Community members, parents, and former HISD students have signed up to read to a first-grader through HISD’s Read Houston Read campaign. 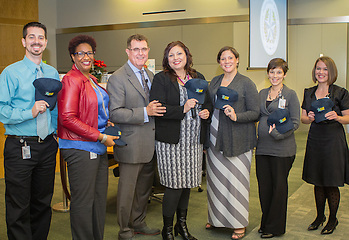 Now HISD employees are also volunteering to read to a student, and one central office department is leading the charge. The entire Secondary English and Language Arts (ELA) team have all spent time reading to students through the campaign. Close to 90 HISD employees recently registered for training for Read Houston Read, which gives volunteers a chance to spend 30 to 60 minutes a week reading to a child who might otherwise never have an adult read to them. Studies show that reading aloud to children greatly increases their vocabulary and cognitive skills. Volunteers can sign up today to read to a child through the Read Houston Read campaign at www.readhoustonread.com.